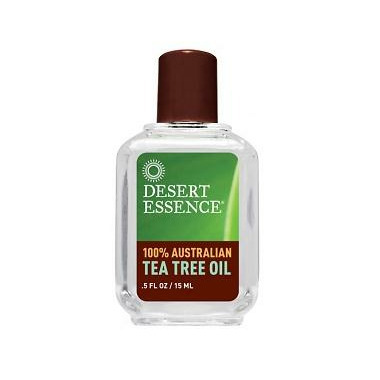 Desert Essence 100% Australian Tea Tree Oil is a naturally antiseptic essential oil grown in Australia. Tea Tree Oil has many household and topical uses. Read our blog post on The Well to see more ideas. Ingredients: Australian Tea Tree Leaf Oil (Melaleuca Alternifolia). Great quality. Excellent product for blemishes. The bottle is small but it clearly states that it is only 15ml. It is highly concentrated, be sure to dilute and a little will go a long way. This would only be better if it had a drop dispensing bottle. Very small bottle, and doesn't have any dropped or way to get the product out. Just an open top, which makes it impossible to not either contaminate it, or spill. I've never bought any type of essential oil without a dropped, very dissapointed. Works well to calm break-outs, but be warned - the smell is potent. It takes some getting used to. I apply it with a cotton swab before going to bed and my skin looks better in the morning. This works well and I would buy again. However, the sizes of the bottles can be deceiving. They all look the same but the bottle I bought is very small. I almost missed it in the box my order arrived in. Make sure you look at the amount of ml before buying. I actually bought this to make homemade water and vinegar cleaner disinfecting. I like the clean smell it brings and I have to assume it's doing the job. Really nice product. I use it to make my own face-wipes (make-up removal pads in a jar with water, witch hazel, tea tree oil). My only complaint is that the oil doesn't pour nicely out of the bottle, so I've lost quite a bit just from it dribbling down the side. Next time I'll pay more for one with a better bottle. Very good product. I use it for acne and blemishes on my face. I dilute it in pure aloe vera juice in a small bottle with a roll on, so it`s easy to apply as well. I use this to clear up blemishes, I put it on at night and in the morning my blemishes have dried up. The smell is strong but you get use to it! I buy it for occasional pimples on my face. Smelle like regular tee tree oil, anot very good but it is efficient as calming and shrinking the pimple. Good price too.